The Cape Winemakers Guild Protégé Programme is ploughing knowledge and experience back into the wine industry with the intake of three new aspirant winemakers and a viticulturist for 2017. This mentorship programme gives talented young protégés the opportunity to rub shoulders with giants in the industry while being developed and empowered to become future winemakers and viticulturists of excellence. With this year’s intake of four new protégés, the total number of interns who have participated in the programme since its inception in 2006 now amounts to 24, a significant contribution towards transformation of the wine industry. Under the mentorship of members of the Guild and the patronage of the Nedbank Cape Winemakers Guild Development Trust, a world of opportunity in the wine industry will open up for these four new apprentices. Two of the new oenology protégés are graduates of Elsenburg Agricultural College in Stellenbosch. Gynore Fredericks of Malmesbury in the Swartland is spending her first year at Tokara under the watchful eye of Miles Mossop, chairman of the Cape Winemakers Guild, while fellow Elsenburg graduate, Elouise Kotze of Brackenfell in Cape Town’s Northern Suburbs joins David Nieuwoudt at Cederberg Private Cellar. The third new oenology intern is Morgan Steyn of Riversdale in the South Western Cape, who is working with Louis Strydom, chairman of the Nedbank Cape Winemakers Guild Development Trust, at Ernie Els Wines. Morgan is a graduate of the University of Stellenbosch. Joining him at Ernie Els Wines is Anné Matthee of Paarl in the Boland. She also graduated from Stellenbosch University and is the second viticulturist protégé since the expansion of the Programme in 2015. Gynore Fredericks has a deep-rooted love for making wine and feels it would be great to someday give back by mentoring young winemakers herself as she is being mentored now. “I figured being able to live out my passion for changing the world and my love for making wine would make for a dream job,” says Gynore. Morgan Steyn believes that the programme will not only help him to become a good winemaker, but also a good leader. “I see myself working with others to strengthen the wine industry in South Africa,” he says. Anné Matthee has always wanted to work intensively with nature and believes that she will be able to gain an immense amount of knowledge from mentors who are respected in the industry. “This is a great opportunity to broaden my horizons and learn from people who have years of experience,” says Anné. With 2017 full of exciting prospects for these four new candidates, 2nd and 3rd year Protégés have all kicked off the year with new mentors. Logan Jooste, the Programme’s first viticulture protégé, spends his final year under the guidance of Pieter Ferreira at Graham Beck Wines, while Clayton Christians is mentored by Gordon Newton Johnson. 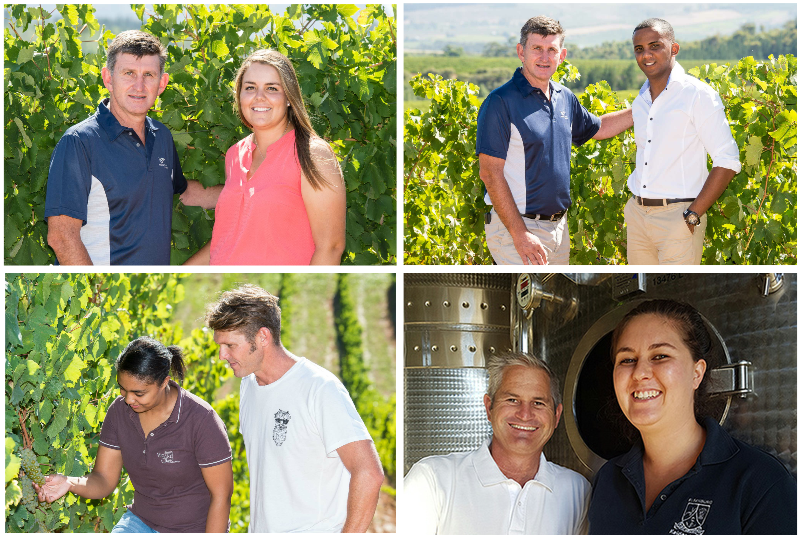 Mahalia Kotjane has started her final year by joining the team at Steenberg Winery under John Loubser, while Kiara Scott is now part of Carl van der Merwe’s team at De-Morgenzon. Sydney Mello has started his second year with Johan Malan at Simonsig, while Banele Vakele has joined Boela Gerber at Groot Constantia. Fellow protégé, Maryna Huysamen, is spending her second year at De Grendel under the guidance of Charles Hopkins. The Guild also offers bursaries to final year and post-graduate oenology and viticulture students. This year, two final year students received CWG Billy Hofmeyr AgriSeta Bursaries, one at Elsenburg Agricultural College and the other at the University of Stellenbosch. A bursary has also been awarded to a Master’s student in Oenology at Stellenbosch University.